Grouple is a ‘collaborative caring’ tool I have been working on for the last 5 months with a team of designers. Supported by the Design Council in conjuncation with the Department of Health, Grouple is one of five projects aimed to help people live better with dementia. The Design Council run a series of challenges. To find out more about this challenges and the others, please visit their website. 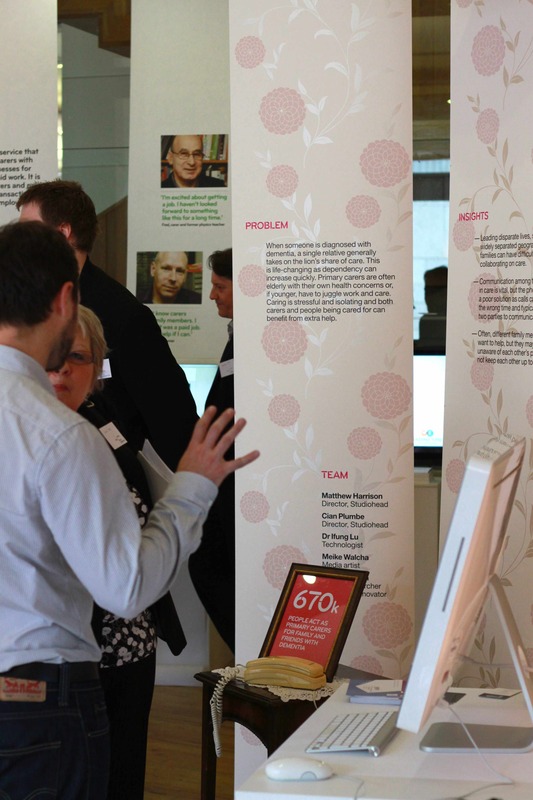 Thursday 26th April was the launch event for the projects at the Design Council and what a fantastic event it was! 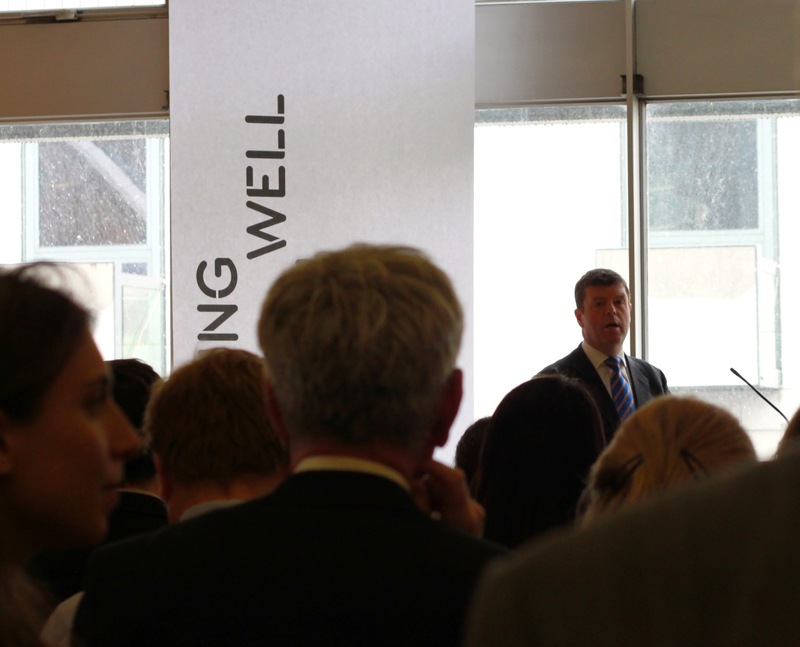 Each project had its own area to display their work and Paul Burstow, Minister Of State for Care Services came along to provide an opening speech. The room was full of dementia experts, all eager to hear about the projects and understand how design can play a role in helping people live better with dementia. 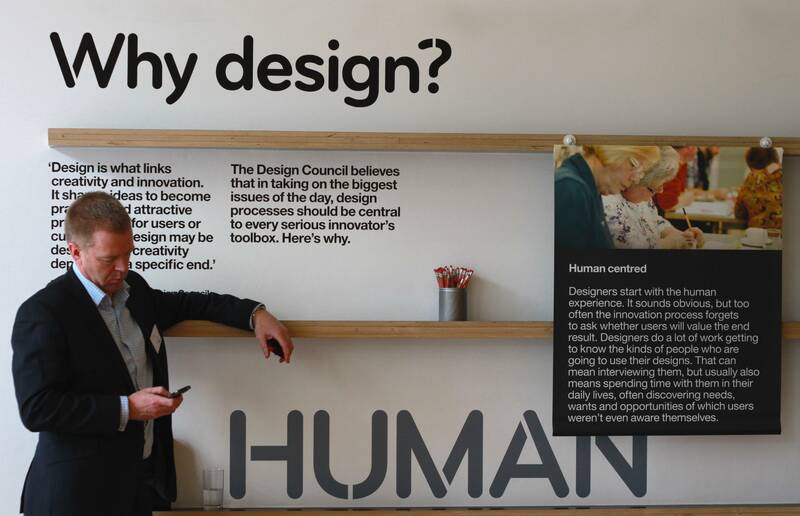 The Design Council had created a series of displays explaining the role of design and importance it plays in social projects. 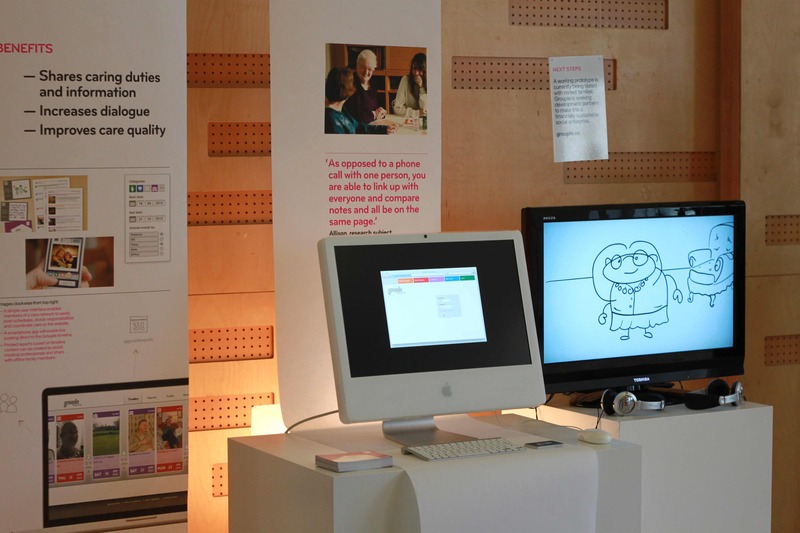 The key words were ‘human centred’, ‘visual’, ‘iterative’ and ‘collaborative’. These words are essential parts of the design process – the end user must be the main focus at all times, the design needs to be appealing and easy to understand, the design has to evolve from learnings over time and being open to a others ideas and suggestions throughout means your end result is more likely to be a success. 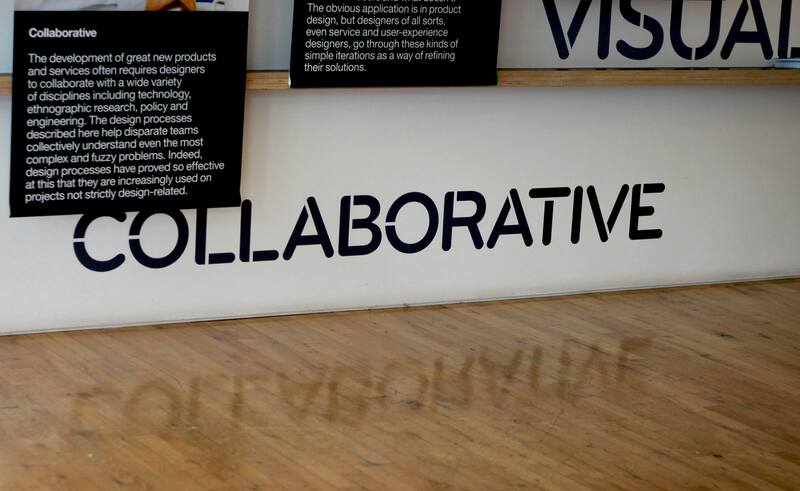 There was something special about the reflection of the word ‘collaborative’ on the floor to reinforce the message! Dementia Dogs have designed a blue print for training ‘career change’ guide dogs to become help for people with dementia, Buddi have designed a prototype wrist band to prevent people with dementia from wandering, Trading Times have designed a service for helping primary carers find appropriate work while caring and Ode have designed a prototype scent timer to encourage people with dementia to enhance their appetite. The five teams had 3 minutes to stand up and explain what their project was about. It was a great way to gain a concise understanding of the challenges each team decided to face and their outcome. Grouple is a caring and sharing tool for families living with dementia. The aim is to relieve the isolation and stress of the primary carer by sharing care, extending the family network and encouraging others to become involved. Based on a timeline, the family can post events, view other people’s events, spot patterns over time and plan for the future. The idea is to encourage families to discuss dementia to reduce the stigma, support each other through out difficult times and remember the good times. We have a working prototype which four families are currently testing and we are now looking for more families to test the site to enable us to develop the system into a public beta for the end of the year. Valuable insights have been appearing from families using the system. Patterns have been forming, communication has been improving and stories of engagement have shown through. 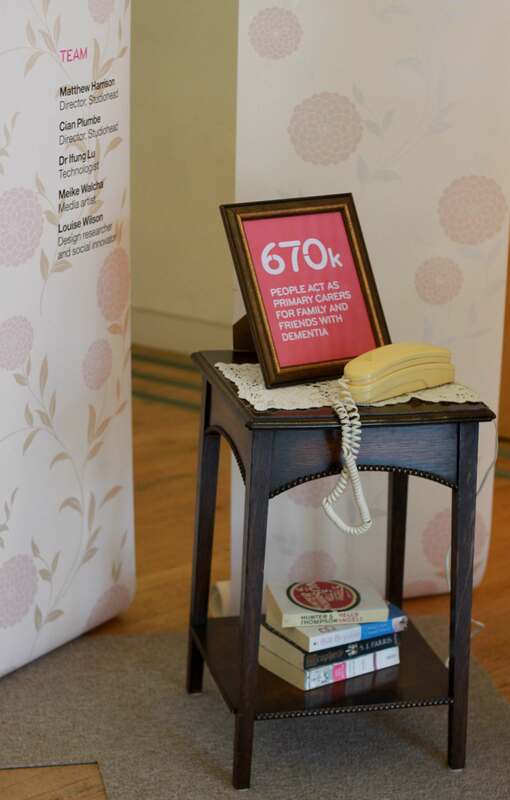 There are 670,000 primary carers in the UK who all help to save the NHS £8billion! These carers need support and we really believe that our system is a valuable tool to help. We are currently looking for partners, organisations to collaborative with and people who can help us scale the prototype and get it to market! WhyNotAssociates have created a series of films to explain the challenge and projects which can be seen on the dedicated Living Well With Dementia website. Thank you to everyone that came to the launch and the exhibition. The following video was used to describe the idea which was submitted for the Design Council’s Living Well With Dementia challenge. The fantastic news is that the idea was chosen for funding so that a working prototype can be developed over the next few months. We (a team of 5 multi-disciplinary designers) are now busy researching and developing the idea to fine tune it and make sure we have captured all the elements to make it a successful tool. If you are caring for someone with dementia or have comments on the concept, please feel free to give as much feedback as you would like. I’ll be posting updates as the project develops…. 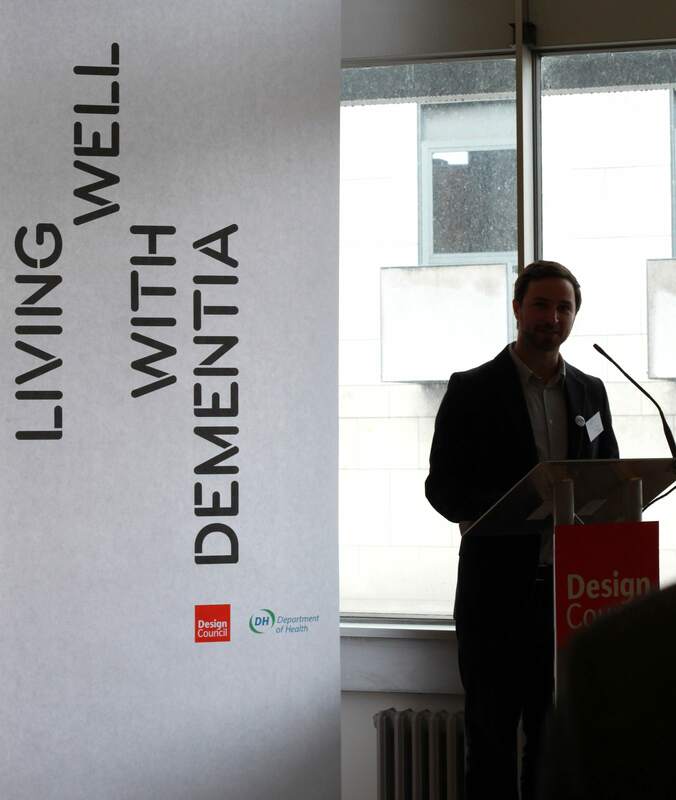 The point of the research was to be able to enter the Design Council ‘Living Well With Dementia’ challenge – something I did with a team of multidisciplinary designers to help make caring for someone with dementia a more manageable and collaborative experience. The best way I could gain a deeper understanding of what it can be like to care for someone with dementia was to speak to as many people as possible, do as much desk research as I could, visit care homes, remember visits to my great grandmother as a child and read, read, read. It was recommended I read the book ‘Keeper – a book about memory, identity, isolation, wordsworth and cake’ by Andrea Gillies. It was sad in parts. Really sad. But fun and enlightening in others. Gillies writes about a lady who cares for her mother in law (and father in law) who is suffering with dementia. They move to a Scottish village with the view to running a bed and breakfast in the country side while caring for her husband’s parents (and running her family). The lady struggles, gets frustrated, feels isolated, tries different tactics, looks for help and questions her actions a great deal. I highly recommend anyone to read the book – it’s incredibly well written. The book is very insightful and helps someone, like me, who hasn’t cared for someone with dementia to start to understand what a challenging and personal experience it is. The following points are what I have learnt about living with dementia over the last three months. I am nowhere near an expert but have learnt a great deal. When someone is diagnosed with dementia, they may have the ‘classic’ signs of losing their memory and getting confused but it is clear that every patient is different. It can also take months if not years to get a straight diagnosis. It is also a disease that develops over a long period (anything from 2 years to 25 years) and while some people are able to look after themselves for a number of years, others require help early on. This makes planning for the future very difficult. If someone appears to be able to cope alone, planning for the future is a tough subject for a carer to bring up with the patient. It is essential that bank accounts, housing etc are thought about for when the patient begins to forget the essential elements to everyday life. Keeping a journal is recommended to remind the patient (and carer) of events and key dates in the future and finding ways to jog the memory to remember comforting scenarios is often beneficial. Carers have noticed sufferers have changes in mood; aggression leading on from frustration and anger towards the carer when the patient is confused as to who they are. It is very sad to hear stories of carers being seen as intruders and often being accused of stealing from the patient. People diagnosed as having dementia have good and bad days. The people living around the patient need to be aware of these and not take the mood swings personally even if this is easier said than done! Keeper describes situations where the patient is very affectionate to her grandson one minute and then accuses him of being a nasty little boy the next. People with dementia often have moments of clarity which can help them deal with a situation or confuse them even more. What should a carer believe or put down to the disease? I have read many accounts where a carer isn’t sure how to deal with a situation. They do not understand how the patient is feeling and in turn feel guilty that they do not understand the disease better. 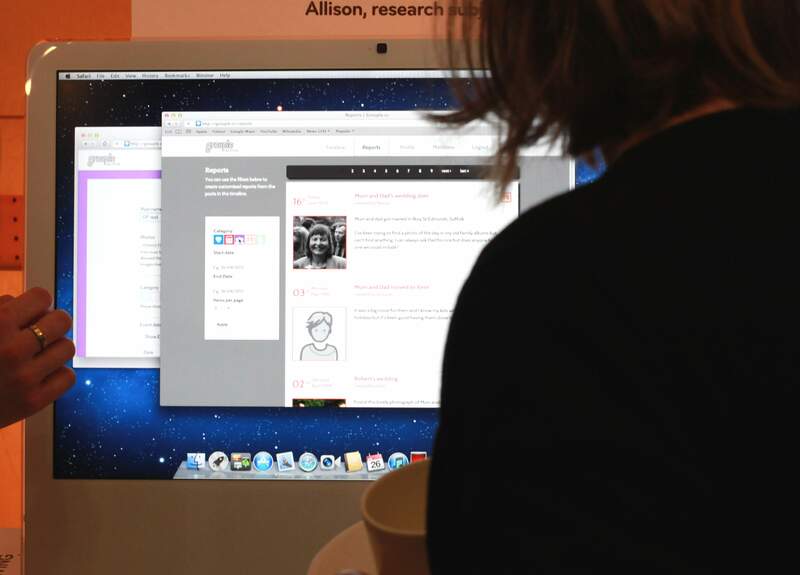 There are plenty of sources of information online, forums to join and organisations set up to help people living with dementia but it is very much a personal journey that a carer and patient go through. Dementia can leave a carer feeling very isolated. The more I learn about dementia, the more I keep relating it to babies and toddlers – expect in reverse years. A baby needs full time care and support from feeding to sleeping and a toddler understands some things but still needs full time care. A patient with dementia will go from understanding most things to needing help brushing their teeth towards the end of the illness. This can be a painful experience for people close to the patient which is where a carer who is not related to the patient often finds caring easier. Non-related carers are able to treat the patient as they are and not get emotionally involved. They don’t feel the need to justify actions or reason with situations. I have heard a number of accounts where families have tried to keep the patient in their own home for as long as possible. Moving a dementia patient into a care home is a good decision to make sure they are looked after properly but can be very disorienting for the patient. Unsettling the patient is not only hard for them but hard for the family to witness. The patient is more likely to remember past stories from their earlier life than recent stories and because of that, keeping the patient in their familiar surroundings can help trigger the memory. Research is currently being done into creating environments that trigger a time in their lives that was most influential to them. The aim is to give the patients a sense of place. carers find it hard to make time for themselves when the disease is in its later stages. When no one patient is the same it’s hard to know what to expect. When caring for a loved one becomes hard the carer is prone to stress. When planning for the future is difficult, the carer needs a simple way to make this possible. When a carer is finding it hard to make time for themselves they can feel very isolated or guilty. The good news is that the National Dementia Strategy has been developed to provide a framework to deliver quality improvements, provide advice, planning and guidance. 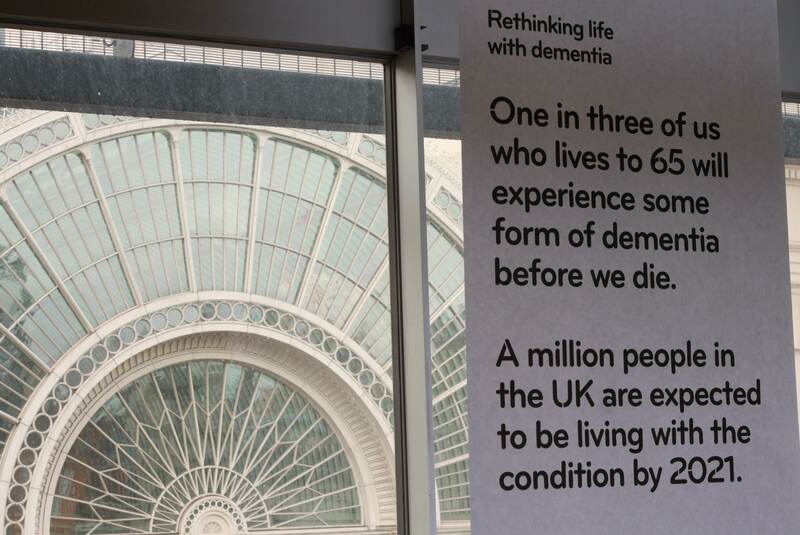 And the Design Council and Department of Health ‘Living Well with Dementia’ challenge is a fantastic example of encouraging designers to be creative in helping to improve the situation.